Does Everything Add Up This Year? Are you considering entering the accounting field? Depending on what type of accountant you wish to be your aspirations may carry you as far as graduate school or similar certification. A higher college education like that is necessary for highly skilled professional accounting work, but comes with a price tag. Most students who enter the accounting field are interested in completing their undergraduate study, then moving on to graduate courses and finally pursuing being certified as a public accountant (CPA). While pursuit of certification as a public account can be a significant initial investment, there are many aid programs available to you to offset the cost. Since the accounting profession is so lucrative and accountants always necessary in the business world, it will certainly end up paying for itself many times in the end. You can find the loans you need for accounting programs – both undergraduate and graduate – through the federal government, state-based loan programs, and private lenders. Federal student loans come from two sources: the federal government administers the Direct Loan Program and commercial lenders may sponsor the Federal Family Education Loan Program (FFELP). Stafford Loans are by far the most popular student loan, including subsidized and unsubsidized variants. Interest rates are dropping: from 2007 to 2012 the Stafford Loan interest rate will be incrementally reduced from a fixed 6.8% to a fixed 3.4%. This may well be the lowest rate going. 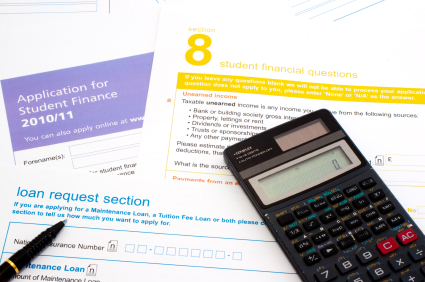 Undergraduate and graduate accounting students are urged to apply every year for federal loans. Apply with the online Free Application for Federal Student Aid (FAFSA). Best of all the Stafford Loans are no credit check loans. Following graduation you’ll have a six-month grace period before your loan repayment begins. If the federal government determines that you have exceptional financial need you may be eligible for the campus-based Perkins Loan, also available to undergraduate borrowers and graduate student loan applicants. The Perkins is much less common than the Stafford Loans due to limited funds. Each participating campus is awarded a certain chunk of money to cover Perkins Funds. Monies are meted out to eligible student borrowers, including accounting students, on a first come, first served basis. How do you get a Perkins Loan? The real key is applying early, with the FAFSA and with college applications. The good news for accounting students with bad credit: Perkins Loans are no credit check loans. Perkins Loans do not enter repayment for 9 months following your graduation. Graduate accounting students, if your Stafford Loans fall short of the full cost of college you might consider applying for a PLUS Loan for Graduate and Professional Students. This is a low interest, credit-based loan that may just give you the financial muscle you need to pay off the balance of your cost of college. If you are trying to borrow a PLUS Loan with bad credit your best strategy is to use a co-borrower. This may be a trusted friend or family member that does have good credit. Once loan repayment begins you’ll have the opportunity to prove yourself when you meet your monthly payment obligations on time. Use a chance like this to improve your credit record and build financial standing power and history. Here’s a tip for PLUS Loan borrowers: if you fail to file a FAFSA, you eliminate your chances for approval automatically. Be aware of the deadline for your graduate program, and make sure to have all of your forms in before that date. This will require some organization and timeliness on your part, but this effort is half the battle in your steps to paying for college in a savvy manner. Should you require additional college funds you may consider carefully the wide variety of private student loans available from almost any commercial lender. Private or alternative student loans often feature high loan limits, variable interest rates and an assortment of borrower benefits and incentives. You should know that, unlike some federal lenders, private lenders will almost certainly perform credit checks prior to offering you an appropriate loan package. With a poor credit history you’ll have to try applying with a credit-worthy co-borrower. A stable friend or family member may be very helpful to you in this situation. Manage your student loans responsibly; only apply for private student loans once you’ve been approved for your federal loans. Then only borrow what you absolutely need. In this way, private student loans can act as a second resource or backup to the often lower-interest loans of the federal government. Be aware that if you are solely relying on private student loans to fund your education as an accounting student, you will need to be credit-conscious for your future and prepared for changing interest rates. Take a look at our list of lenders below. You’ll discover a wide assortment of private loans, many of which are well suited to an accounting student. Sallie Mae, one of the most prolific student loan providers, offers five slightly different private loans for undergraduates: Signature Student Loan, Tuition Answer, Signature Student Loan for Community Colleges, Continuing Education Loan, and the Career Training Loan. Each could be tailored to the needs of an undergrad pursuing an accounting career. Many private banks, such as Suntrust and Wells Fargo, offer student loans appropriate for accounting students pursuing undergraduate or graduate education. Many of these loans offer simple online application, competitive interest rates, and no repayment until after graduation. Another benefit of these private lenders is familiarity with the financial institution. You may choose to borrow from your personal bank, and so keep all of your financial dealings neatly in one place. Professionals to fill highly sought after job titles such as Certified Management Accountant and Certified Internal Auditor are in demand and very selectively chosen. Continuing education and further certifications may be required even after you qualify as a CPA to qualify for one of these jobs. Unfortunately, few of these short-term training programs qualify for federal aid. More than likely you’ll be shopping private lenders for short-term private loans like those above offered by Sallie Mae. The increasing demand and high esteem for these specialized positions, though, make the immediate investment in your education well worth it once you are qualified and reaping the rewards and benefits of your efforts in a unique accounting position. If you manage your student loans as carefully as you would a client’s financial books, you’ll be sure to come out in the black. Especially as an accounting student preparing for a future in finance, your actions in borrowing and paying for your education can be superb practice in decision-making for a financially secure and smart professional and personal life. Treat your personal debts and payments as you would advise a wise colleague or client to, and your experience in paying for college can be an excellent indicator of your success as a professional accountant.